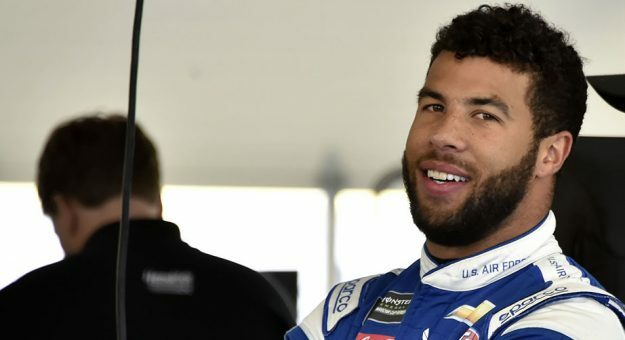 Bubba Wallace jumped to the top of the board in Saturday’s second Daytona 500 practice for the Monster Energy NASCAR Cup Series. Wallace laid down a fast lap of 195.020 miles per hour in the No. 43 Richard Petty Motorsports Chevrolet Camaro. Ty Dillon finished the session in second with a lap of 195.008 mph in the No. 13 Germain Racing Chevrolet Camaro. As select drivers and teams elected to make single-car mock qualifying runs, drivers David Ragan, Ricky Stenhouse Jr. and Paul Menard teamed up with a group of other Ford Mustangs for a drafting run, earning them the final three positions in the top five at the end of practice. Ragan earned the third-fastest time at 194.940 mph, with Stenhouse finishing fourth (194.574 mph) and Menard in fifth (193.586 mph). What was scheduled to be a 55-minute practice session was cut short due to rain after the red flag was displayed with roughly 24 minutes remaining. The next time Monster Energy NASCAR Cup Series drivers hit the track will be Sunday for Daytona 500 Qualifying (12:10 p.m. ET, FOX, MRN, SiriusXM NASCAR Radio), which will set the front row for the 61st annual Daytona 500 (Feb. 17 at 2:30 p.m. ET, FOX, MRN and SiriusXM NASCAR Radio) and the starting lineups for the Gander RV Duel (Feb. 14 at 7 p.m. ET, FS1, MRN, SiriusXM NASCAR Radio). Joe Gibbs Racing came out of the gates swinging in Saturday’s first Daytona 500 practice for the Monster Energy NASCAR Cup Series, as Martin Truex Jr. led the session in his No. 19 Joe Gibbs Racing Toyota Camry. Truex Jr. and two of JGR’s Toyota brigade — Kyle Busch and Erik Jones — teamed up to test out the draft, while Denny Hamlin and the No. 11 team elected to make mock qualifying runs ahead of Sunday’s Daytona 500 Qualifying (12:10 p.m. ET, FOX, MRN, SiriusXM NASCAR Radio). Truex carried a session-leading lap of 195.920 miles per hour around the 2.5-mile Daytona International Speedway, followed by Busch with a lap of 195.852 mph and Jones with a lap of 195.793 mph. Richard Childress Racing and Germain Racing had the same idea as Joe Gibbs Racing, linking up to draft during the first 55-minute session. NASCAR Xfinity Series regular (and the defending champion of that series) Tyler Reddick, who is competing in his first Daytona 500, laid down the fourth-fastest lap of 194.095 mph. Ty Dillon rounded out the top five, posting a top speed of 194.032 mph. Final practice is set for 3:05 p.m. ET and will run for 50 minutes with coverage on FS1.